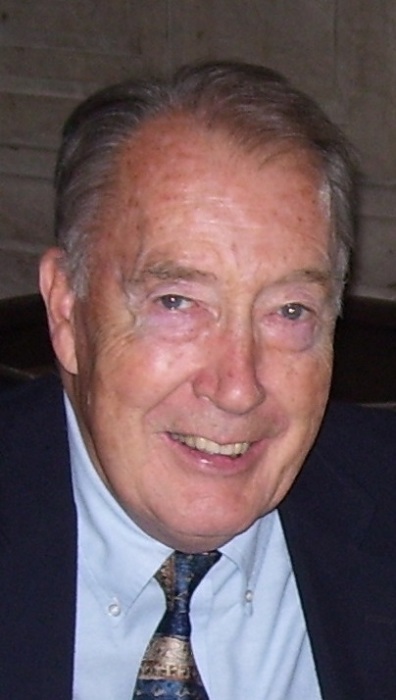 Obituary for William M. Kenville | J. F. Rice Funeral Home, Inc.
William McGill Kenville of Binghamton went to be with the Lord on June 19, 2018. He passed away peacefully with his wife and children at his side. Bill was born on December 1, 1930 in Queens, growing up in Elmhurst, N.Y. He resided in Binghamton since 1959 and was a long-time communicant of St. Thomas Aquinas Church. Bill was predeceased by his parents William and Ann Kenville; brother Thomas Kenville and wife Patricia; son-in-law John Combs; his in-laws Edward Miller, Joseph Miller, Richard Miller, Eleanor Miller Nolan Somers, Rita Miller, Patricia Miller Wilson, Paul Nolan; and nephew John Miller. Bill is survived by his loving and devoted wife Violet, to whom he was married for 65 years. He will be dearly missed by his children William (Victoria) Kenville, Mark (Kathleen) Kenville, Karin Combs and Kristeen (Michael) Hickey; grandchildren Shane (Emily) Johnson, Kelly (Matthew) Lilly, Ryan (Talia) Kenville, Michael (Beth) Hickey Jr., Maura (Graziano) Zazzara Jr., Patrick Kenville, Clare (Ty) Murphy, Sean Hickey, Shannon Hickey, Katherine Hickey and Faith Kenville; great-grandchildren Morgan Johnson, Jack Lilly, Henry Lilly, Ava Zazzara, Luke Lilly, Graziano Zazzara III, Michael Hickey III, Mia Zazzara and James Hickey. He will be fondly remembered always by his sister-in-law Anita Miller; nephews and nieces Glenn (Amata) Miller; Linda (John) Kittredge; Edward (Judy) Miller Jr.; Judith Miller; Richard (Michelle) Miller, Joseph (Karen) Miller III, Mary Lee (Dennis) Tripicco, Mandy (Philip) Doggett, Tammy (Richard) Balles, Richard (Julia) Miller II, Paul Nolan, Kathy Nolan Dudley, and Laurie (Bill) Maloney. Bill graduated from St. Bonaventure University in 1953, where he was a three-year varsity basketball player. Upon graduation, he held five scoring records and four rebounding records. His college career merited him All-American Honorable Mention honors in multiple years from the Associated Press, United Press International and Catholic Colleges. He was inducted into the St. Bonaventure Hall of Fame in 1971 and the Greater Binghamton Sports Hall of Fame in 2018. Bill was selected by the Syracuse Nationals in the 1953 NBA draft. He played point and shooting guard for the Nationals from 1953-1956 and with the Fort Wayne/Detroit Pistons from 1956-1960. The highlight of his professional career was playing in two Championship Series with the Nationals, winning the NBA Championship in 1955. He was high scorer in the seventh and deciding game of the Championship. Bill retired as Director from the Broome County Probation Department, where he worked for 30 years. He was on the Board of Directors of the Binghamton Housing Authority, volunteered at St. Mary’s Soup Kitchen, was a member of Perpetual Adoration at St. Patrick’s Church, coached St. James CYO basketball and was a member of the local St. Bonaventure Alumni Chapter. Bill will be remembered for his humor and wit, and ability to entertain people with his stories. He enjoyed vacationing, playing golf and watching sports. The family would like to express their great appreciation for the dedicated nursing staff in ICU and Seton 1 at Lourdes Hospital. Most importantly, the family extends sincere gratitude to the many clergy and religious who spiritually ministered to him and the family. Special thanks to Monsignor John Putano and Sister Hermenegilde for their compassionate support and guidance. Calling hours will be Sunday, June 24 from 4:00 pm to 7:30 pm at J.F. Rice Funeral Home, 105 Main St., Johnson City. A Mass of Christian Burial will be celebrated on Monday, June 25 at 10:00 a.m. at St. Thomas Aquinas Roman Catholic Church, 1 Aquinas Street, Binghamton. Burial to follow in Calvary Cemetery in Johnson City. In lieu of flowers, the family asks to please consider making a donation in Bill’s name to the St. Bonaventure Athletic Fund or to St. Thomas Aquinas Church.